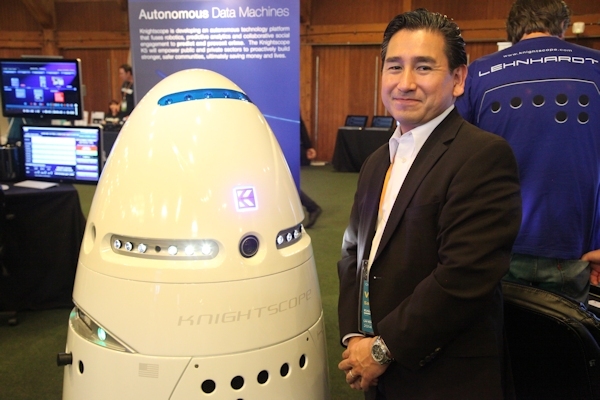 Knightscope created the K5 after being horrified by the Sandy Hook Elementary School shooting, Li said. Because there can never be an armed officer in every school, this could be an alternative. He said that the K5 is meant to make a perpetrator at least do a double take, if not leave entirely. And, if they don’t, the K5 can alert authorities and record the entire situation. Knightscope expects that the K5 can cut crime in half in a designated area. To do so, it’s paired with an equally powerful tool: software. Li showed me a suite of tools K5 operators could have at their disposal, including being able to cut from a live feed of the data a robot is taking in at any moment. Each robot would collect about 90 terabytes of data a year, Li said. Knightscope has the ability to pair that data with social media content and crime reports, outputting a map of crime filled with relevant data. Humans could then use the crunched data for further analysis or investigations. Li referenced the Boston Marathon bombing as an instance where this type of surveillance would have been useful. Imagine if the police didn’t have to sort through hours of footage and thousands of tweets to sift out relevant data. This type of software could do it for them, and the K5 could augment the material they have to work with. Knightscope will test the newest version of its robot, which it revealed in December, with a Silicon Valley company this year. The company will begin offering the robot on a large scale next year. Organizations will be able to “hire” the K5 for eight hour shifts for $1,000 a month. Li said the company already has a waiting list of at least 30 companies. Farther out, the company may move into actually working in law enforcement. But, for now, it is focused on businesses. Before the K5 begins roaming freely, Li said Knightscope will refine how it interacts with people. He said people have responded positively to the robot overall, but there are still some fears to quell. For example, K5s could livestream the data they collect to the public, instead of just to a private government database. Li said the K5 protects us against greater fears, like being shot at. He placed its surveillance on the same level as an ATM camera or mall security. “I think those fears are going to turn into what is already the majority: enthusiasm,” Li said.